The National Association of Judgment Recovery Professionals has trained thousands of people nationwide since 1999 with the most advanced, most comprehensive, and most practical Full Training Course, now in its 3rd Edition, Entitled: Professional Judgment Recovery, 3rd Ed. The NAJRP Course was written by Jon Scott who is the national director of the association and author of this Bestseller in the legal industry. Jon is also a practicing licensed private investigator and with over twenty years experience, along with tremendous knowledge, insights, highly efficient tips, shortcuts, strategies, and understanding of resources,.... ALL incorporated in the 3rd Edition Course! Jon Scott has personally trained many attorneys whom purchased his course and he has pioneered Professional Judgment Recovery to the most advanced levels imaginable, and has been the very first to incorporate and teach all the highly advanced techniques, methods, strategies, and procedures that private investigators use to locate people, locate hidden assets, locate bank accounts, locate places of employment, locate businesses, locate real estate, teaching you how to conduct a professional surveillance, how to use expert pretexts (a created scenario made up for the purpose of legally and strategically persuading someone to assist you in your legal and legitimate objectives and purposes) and so much more.. You simply will not find these masterful investigative techniques in any other Judgment Recovery Course. We are also the only association that provides unlimited and routine case referrals to it's associates nationwide (those whom learn from Professional Judgment Recovery, 3rd. Edition, by Jon Scott). Jon Scott has already purchased and studied the best of the other courses our there since 1999, which also provides our associates with full assurance that the NAJRP course "Professional Judgment Recovery, 3rd. Ed." has absolutely no missing useful or important information on Judgment Recovery. 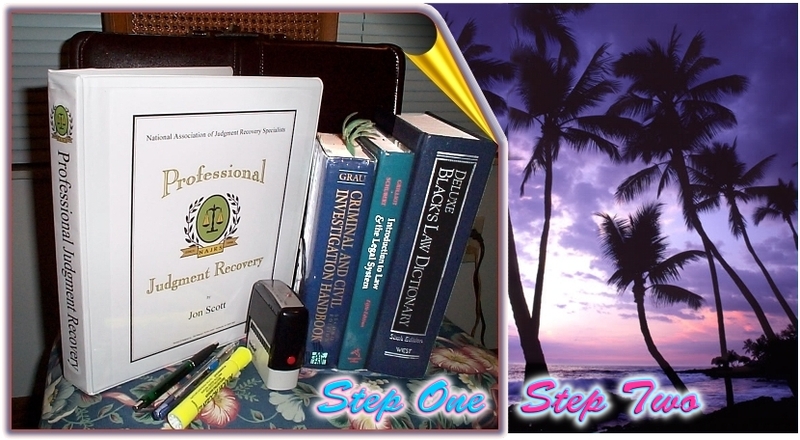 In fact, the author has sold non-exclusive rights to the first and second additions of the Professional Judgment Recovery course to a major Investigative materials publisher to allow many thousands of private investigators across the country to become trained in this specialized area, to the highest quality and standards possible. However, the NAJRP is the only place where the Third and fully revised version can be purchased (along with all the most advanced updated forms you will need to use (according to the new court laws and supreme court rulings). No other course has copyright to provide you with THESE ESSENTIAL CUSTOM FORMS. Plus, at the discretion of the director, so long as there is no violation of any of the NAJRP Judgment Recovery Code of Ethics & Member's/Associate’s Pledge, you also have full lifelong membership to NAJRP which is is granted at the director's choice (he will normally grant it once the associate shows they have successfully recovered on at least one case). Nationwide Judgment Recovery networking with thousands of other member Judgment Recovery Professionals to assist each other with the processing of cases, sharing information, working together on the same assignments, sharing valuable and ongoing developed knowledge, tips, insights, resources, professional collaboration, companionship, celebration events, and more. Whenever the opportunity presents, our associates also receive referrals from this website! Unlimited and updated free expert online resources gathered from 1999 to the present to assist our Professional Judgment Recovery associate in locating people, their assets (especially when hidden), employments, and businesses. Free notifications and updates to all future additions of the course - always have the latest tools you need to make the highest returns on collecting judicial judgments, finding judicial judgments online (unlimited), and using the best Judgment Recovery forms available! Our forms are by far the very best and the Agreement for Assignment of Judgment incorporates the most powerful benefits and protections you will find in any Judgment Recovery Course on the market. Access to RESTRICTED DATABASES that only verified licensed private investigative agencies and others such as law enforcement agencies are authorized to use. As a personal associate to NAJRP, you are also automatically considered a personal professional associate of the Author's private investigation firm that serves nationwide, and therefore upon review, may be approved to submit requests to any of our company staff members of requests to search these databases in helping you quickly and efficiently locate debtors, locate assets, locate bank accounts, locate employments, locate real estate properties, locate businesses, run a background check, run a criminal background check, and many others! All of these restricted database requests will be at a great discount to our members only, and members may be granted full ability to access on their own at the director's discretion upon reviewing duration of memberhsip and background of member. However, more good news is that the course itself teaches our associates how to legally obtain these crucial pieces of information without needing to access any fee-based databases. 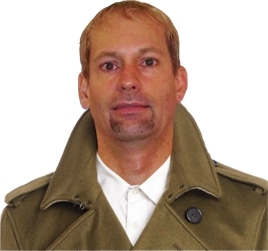 The Author is a licensed private investigator with over twenty years experience in obtaining every type of public record, background information (such as assets, bank accounts, and employments) LONG BEFORE THE INTERNET WAS AVAILABLE. In fact, he continues to use most if not all the existing FREE resources of public information that is available to anyone (instead of fee-based databases) - and he teaches his associates how to do it also. Our Members will also be able to have unlimited consulting with the Author of the Course himself. Jon Scott, along with many of your other Member Associates all over the country will also be glad to work with you on your cases and work to become successful together as a team (upon membership approval). True Teamwork and Expert Know-How are just a couple reasons why our group is the best choice to learn from and prosper with for the long-run. No other Judgment Recovery Association provides this level of commitment to the success and prosperity of its fellow Associates. The course by itself however is all any serious business-minded person needs to be successful in Professional Judgment Recovery. Our associates have all the tools they need from the course itself and do not need to rely on anything else. Fantastic Introduction! But.. What exactly IS .. "Judgment Recovery" ? Click here to learn more about Professional Judgment Recovery! Read the Full background of Judgment Recovery & the NAJRP Course. Greetings new business affiliate and fellow associates. This is the National Association of Judgment Recovery Professionals and is directed by Jon Scott who is a professional licensed investigator and author of the book "Professional Judgment Recovery, 3rd Ed." Since the beginning of the Internet, we have specialized in assisting the public with collecting on their court awarded judgments that they have won, but have not been able to collect on. We have associates located in every city and state nationwide whom would be glad to assist you, and at no up-front cost whatsoever. Jon Scott is the author of the nation's bestselling book that has taught thousands of people (including over ten (10) attorneys) how to collect on their judgments for themselves and to even go into business for themselves if they'd like, in helping many others with collecting on their cases, using his licensed investigative techniques acquired from over twenty-five years of investigative experience - beginning with academic legal studies from his AS degree in 1995, and further University studies. As winner of the lawsuit, when you use the option to have a Judgment Recovery Professional work to collect on the judgment, you also don't pay that person anything at all up front. You and the case recovery specialist simply make a fair split of the amounts that the specialist is able to collect, and you are either handed or mailed a check for your share of the collection. It's really that simple. If you don't have an open lawsuit that hasn't been paid off, please still feel welcome to refer the NAJRP.com to any other friends or family members you know of whom may have a lawsuit they've won and not been able to collect on it. Our associates have been trained by one of the best licensed private investigators in the nation and are very warm, friendly, highly professional, and take great pride in helping others to achieve their goals. OUR EXPERTISE RESULTS IN MAXIMIZED COLLECTIONS OF UNCOLLECTED COURT AWARDED JUDGMENTS. Have one of our 1000's of nationwide pros in every US state collect your case for FREE (no cost at all up front) and/or, obtain the Nation's most comprehensive, intense, informative, and lucrative training course to Learn The Professional Business for Yourself! "Hey Jon, I just wanted to say thanks for the time you took to chat with me and help me better understand phone negotiations with judgment debtors. I look forward to implementing your ideas on scripts and pre written examples." Thanks! Mike P.
Have us do the collecting. If you would like truly NO UPFRONT COSTS WHATSOEVER help collecting your Court Awarded Judgment, please just fill out the short form at the link below to tell us a few things about your case, so we can have a Judgment Recovery Professional contact you back and in a timely manner. We are the LARGEST national association for Professional Judgment Recovery where you either have us do all the collecting and/or, obtain the nation's number one bestselling full training course to learn the business and profession of helping others yourself (and obtain unlimited referrals from this site FOR LIFE). Option 2. Learn how to collect on it yourself and even go into business for yourself, if you so desire, professionally helping many others collect on their lawsuits as well, from the nation's best-selling book and training course entitled "Professional Judgment Recovery 3rd. ed". It is authored by: Jon Scott, a licensed private investigator with over twenty-five years of experience, who is also the director of the association. At author's discretion, it also comes with FREE life-long membership and personal guidance from the author himself. So either way, whether you have one of our professionals help you at no up-front costs or if you'd prefer to work on the collection process yourself, you now have the very best chances of recovering as much as possible from your court awarded judgment - having NAJRP with you every step of the way or, doing all the collecting so you don't have to at all.